To make these waffles even better, serve topped with vanilla ice cream. Melt butter in a skillet over medium heat. Stir in brown sugar, cinnamon, and optional nutmeg. Cook about 2 to 3 minutes, until bubbles form and it begins to take on a melted caramel consistency. Stir in bananas and pecans. Cook an additional 3 minutes, stirring frequently. Remove from heat and stir in vanilla or maple extract. Cool to room temperature. 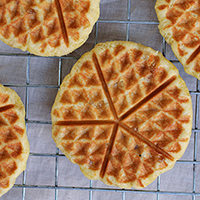 While the pecan-banana mixture cools, prepare waffle batter and warm waffle iron. Once cooled, reserve 1/2 cup pecan-banana mixture in the skillet and stir the remaining sauce into the waffle batter just until combined. Cook according to waffle maker instructions. However, these tend to be a bit stickier than other waffles, so you will probably need to grease the waffle iron between each batch. To serve, warm the remaining sauce in the skillet until heated through. Pour over waffles. The waffles are equally good with maple syrup or even plain. They freeze and reheat in the toaster beautifully.